Lake Mead. Bathtub ring! Get some Lysol and a brush! The California drought may be big news in California, but there doesn't seem to be much that can be done about it. In any event, it is continuing unabated and only getting worse. Meanwhile, where I am, it is usually dry, and this summer we have been getting rain - heavy rain usually - practically every day. Go figure. We have made a bunch of posts about the California drought because hit has been a big topic in the animation field. Now, that may be because it is such a dire situation, or maybe because there are so many animators based in California.... But no matter! The animations tell the story better than anything else can, so let's take a look. In the animation above, note how different the ice packs on the Sierra Nevada and Yosemite look between 2011 and 2014. Also, the entire value is lighter in 2014 except for the missing snow, suggesting stuff isn't growing there as much as it used to. The area directly along the coast isn't affected much, but inland it sure is. 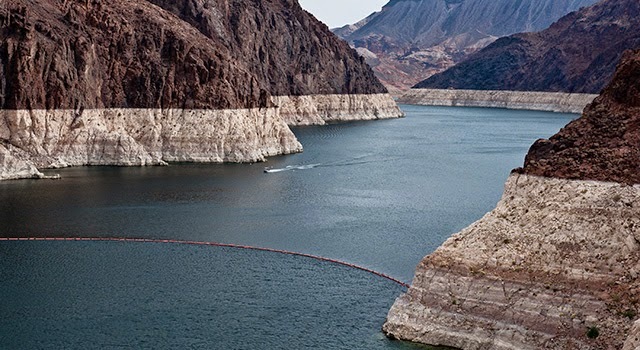 Lake Mead in Nevada is shrinking rapidly. The animation above shows the change in one year. It now is only 39% full and is at its lowest level since 1937. That it has been this low before suggests that this is a natural phenomenon having to do with rainfall patterns and not some apocalyptic end-times manmade disaster. But then, it could be an apocalyptic end-times manmade disaster. We'll know for sure if it doesn't go away. Sometimes comparisons like the above animation are the best way to grsp what is really going on. Boats had to flee that inlet because the water levels had dropped so low that the boats would have gone aground. This sort of thing actually has been happening in many places around the country, not just in California, and is causing a lot of property value losses (as if the housing market weren't bad enough already). As of this writing on August 2, 2014, 58% of California is under the most severe drought classification and things are happening fast out there. In just week, the area of severe drought expanded by 22%. Sine fine folks in California are starting to grumble about "those people" who have water when they don't because of "antiquated water laws." I don't know who "those people" are, but there's always some of "those people" out there to blame when you need them, I know that. And laws are "antiquated" when they prevent you from getting what you need, otherwise they're just "quaint" and "historic." Incidentally, California grows a goodly chunk of the food supply of the United States, so this will wind up affecting pretty much everyone, in big ways or little ones. 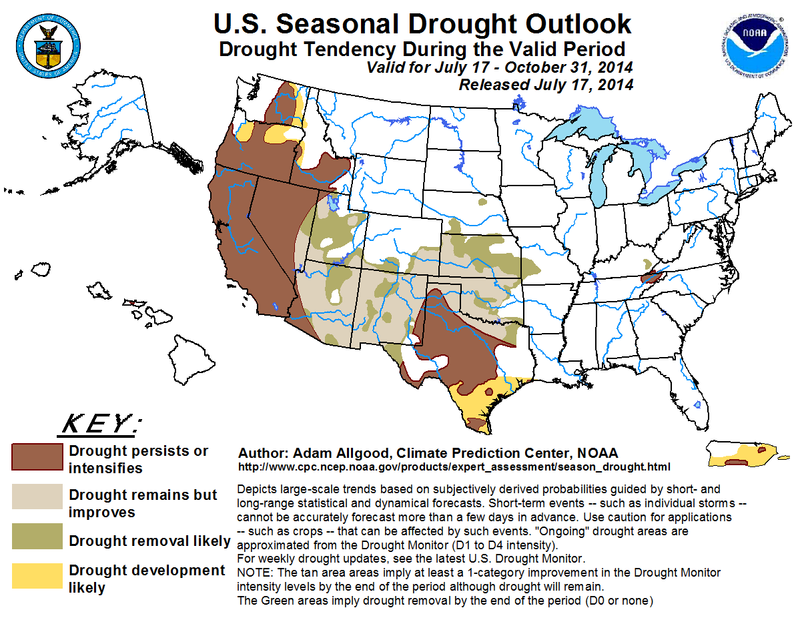 The drought area - the dark brown area - is projected to expand for the rest of the year. So, if anyone knows any good rain dances, head out to California, they are in dire need.